Guest author Tori Morel-Orchard makes the case for a positive news agenda. This post is based on a CIPR Professional PR Diploma thought leadership assignment. The world can seem like a scary place sometimes, and while we would all like to think we look for the good in life, the human psyche is naturally drawn towards negative news – this is both a cultural and evolutionary phenomenon. However, when it comes to public relations we do not tend to want negative news to be the focus. So, why do we not do the world a favour and push out more positive stories? This comes down to both human habit and corporate strategy and there clearly needs to be a re-evaluation in this area. The Edelman Trust Barometer 20181 shows that trust in business, government, NGOs and the media has hardly changed since 2017 and that we now lie in ‘distruster territory’. What many brands misunderstand, however, is that trust does not always depend on what you do, but also what you do not do. This is where ethics come in, and in a competitive world where hiding is not an option companies and senior figures need to work hard to foster strong ethical values to all aspects of their behaviour. For instance, after the devastating Grenfell Tower fire of 2017, prime minister Theresa May made the decision not to meet the survivors of the fire. A year later, she has admitted regret2 for not doing so, but clearly the damage is done. Even the mayor of London, Sadiq Khan, has condemned her apparent lack of empathy3 and action on that occasion. Another significant reason for our very low trust levels is a term we have all become familiar with – ‘Fake news’. Nearly seven out of every ten respondents to the Trust Barometer survey were concerned about false information being used as a weapon, with over half not knowing if a piece of news was even produced by a respected media organisation. It is very worrying; in fact, on 6th October 2018, it was revealed in The Times4 that social media bots sponsored by the Kremlin have been spreading untruths about western food and water supplies, portraying genetically modified foods as dangerous, amongst many other damaging claims aimed at undermining western society. Socio-political tensions the world over, resulting in general bad behaviour from senior leaders, economic recessions, and the extreme polarisation of political views have all played a part in our feeling less than comfortable at this moment in time. This kind of environment where there is a lot of trust to earn back is certainly difficult for PR practitioners, but perhaps with more authentic and positive news we can begin to make a difference and see that there are reasons to feel more grounded and optimistic. Back in March 2018, Matt Ridley, a British journalist, businessman and author of ‘The Rational Optimist’, highlighted this negativity-plight in his column in The Times5, and I intend to pick up on this point. His concern surrounded the news of a mystery ‘Disease X’ which the World Health Organisation (WHO) had suggested could become a global pandemic if it were to be borne from somewhere. His view was that this kind of ‘fictitious’ (and rather vague) bad news is designed to play on our vulnerable emotions and addiction to pessimism. Indeed, while that is probably the case and it certainly grabbed our attention, it is also true. Thanks to the fact that not everyone understands Darwin’s evolutionary theory, the general public will take the ‘Disease X’ headline as a new finding and assume we are all doomed. In reality, something, whether it be a superior species, a natural or socio-political disaster, or devastating disease, will wipe out the human race and we certainly will not be around to assess the damage. A case in point – BBC News recently featured the following as its lead website story: ‘Life expectancy progress in UK 'stops for first time'6. Now, forgive me for a lack of concern, but surely our life expectancy cannot be anticipated to keep rising until we become immortal. The article stated that women are now sticking around for a good 83 years and for men 79, according to the Office for National Statistics for 2015-17. On average, that is not terrible. However, the clever use of a top line is ‘hook-line-and-sinker’ for those of an anxious disposition. Evidently, not only are we addicted to bad news but there are some savvy PR folk out there preying on such gaps in our knowledge to win headlines; certain right-wing publications are dedicated to worrisome stories such as these. Either way, this begs the question as to why we enjoy tormenting ourselves. From an evolutionary perspective, this could be put down to the theory of loss aversion whereby people tend to prefer avoiding losses to acquiring gains. Professor Russell A. Poldrack from Stanford University examined this theory in the journal Scientific American where he and his colleagues monitored brain activity while volunteers decided whether to take a gamble with real money. Professor Poldrack found enhanced activity in the participants' reward circuitry of the brain as the amount of the reward increased and decreasing activity in the same circuitry as the potential losses built up. In addition, the reactions in the subjects' brains were stronger in response to possible losses than to gains. He also highlights the theory that the areas of the brain which are responsible for emotions (the insula and amygdala) are triggered by the prospect of potential loss. You can see where this level of self-preservation may have come from, for while we live fairly danger-less daily lives now (in developed regions), our ancestors will have had to weigh up pretty considerable risks when hunting for their dinner in the wild. While we cannot do anything to alter our evolutionary path, when you look at the trend for pessimism from a cultural perspective this is much more applicable to public relations practise. In modern terms, there is really one word for it – shareability. Bad news happens in an instant, whereas good news often takes a long time to build up and is much less condensable, therefore less shareable. For example, “Did you hear that, after years of research, analysts have found that the state of global health is actually increasing?” is really quite dull in comparison to “Did you hear today that humans are significantly more unhealthy than twenty years ago?” which prompts us to worry about, and try to change, our life choices. We bond over bad news, we feel comfort in worrying together around the doomsday fire. According to Maslow’s ‘Hierarchy of Needs’ model8, we are naturally drawn to information which helps us survive above all else. Therefore, it is no wonder that we are culturally, and biologically, drawn to bad news in an age of information overload – at least with bad news we can prepare for the worst. Daniel Levitin lays out in his book ‘The Organised Mind’9 just how much information we consume every day. He says that during leisure time we each process 34 gigabytes or 100,000 words every day, the 21,274 global television stations produce 85,000 hours of content a day and YouTube uploads 6,000 hours of video on the hour (2014). With all of that plus the amount of social media we consume daily, it really is no wonder we feel the need to pick out the information which could be viewed as crucial to our survival, i.e. what not to do, eat or go in order to stay safe. With careful management and consideration, public relations practitioners can make more of an effort to spread happiness and optimism. It takes more work, certainly, and they must be authentic and not fabricated stories, but it is possible. People like Max Roser, founder of ‘Our World in Data’11 (OWID) and a researcher at Oxford University, are pulling out all the stops to show that the world is a better place than we know. In one article12 on OWID, he draws on research from opinion research organization Ipsos MORI which showed that most people think global poverty is rising when in fact the opposite is happening; Matt Ridley underlined this same study in his article in The Times. It found that the share of people living in extreme poverty across the world has been declining for two centuries, with rapid decreases in the last 20 years. Max also used YouGov data to create a chart13 showing which country is most positive about the world – Great Britain and the USA rank fairly poorly at 4% and 6% respectively. The BBC World Service recently broadcast a piece about ‘compassion fatigue’14, highlighting that there is so much bad news in the media that we are becoming numb to our feelings and that empathy levels are actually declining. We cannot deny that bad news exists and we should know about it to live an authentic and knowledgeable existence, but it is all about balance. The time to make a change is now. While trust in the media is still very low, the Edelman Trust Barometer also shows that there is renewed confidence in technical and academic experts, and even in CEOs. In which case, we should strike while the iron is hot and use these experts to reveal uplifting statistics, trends and stories. In public relations practice, negative stories are avoided at all costs, but it is often the case that existing or newly conducted research will be used to push the cause of the company in question – such as a drugs company jumping on a negative health story, trying to save the day. As well as formulating a solid foundation of research and credibility, the Australian communications agency ‘Ellis Jones’ points out in their blog post on positive PR15 that the key is in thinking creatively. They highlight that the best ways to make a positive impact on the media space are to be authentic, diverse in your choice of platforms to target, and creative. In particular, they underline the fact that any good news story must not be staged, and that it should be people led, not company led. While it is widely understood that social purpose is an important part of corporate strategy, a reputation for being a caring corporate entity does not come from simple communications in the form of a press release or article, it comes from action. As Ellis Jones’ writer points out in their blog post, the fact that an NFL player went to visit a sick fan in hospital speaks louder than a thousand press releases. By word of mouth, that gesture will be discussed amongst their fan base and beyond. The key here is that they did not choose to publicise it – that was not the point. This kind of ethical and caring behaviour should not just be a tick in the box for companies, it should be done for the right reasons. When carried out authentically and with a smile it can really speak volumes; customers are much more likely to gravitate towards such values. As ‘CSR Pulse’ points out in their article16 on the topic, if any public relations surrounding these positive achievements and actions is done too aggressively, it can appear as a sticking plaster for the company’s other less-appealing endeavours, or as ‘greenwashing’. CSR Pulse describes greenwashing as “the propelling of environmentalism or green credentials to suggest that a company’s policies and products are essentially environmentally friendly.” However, the term can apply to any positive actions which are not viewed as being authentic. How many beach cleans and ‘litter picks’ do we see in the local news? This repetition is monotonous and frankly quite boring. In a visual world where Instagram and Pinterest take up far too much of our time, I would personally like to see an optimistic time-lapse of their progress as well as a promise for more bins along the seafront. As previously mentioned, good news takes time, attention and originality. It is quite modest in comparison to its brash, attention seeking alter-ego. While spreading such cheer could very easily tread a thin-line between advertising and public relations, ultimately it is no different to using bad news to advertise your services. So, give optimism a chance. All it needs is a little bit of time, creativity and, ultimately, the guts to be different. Edelman.com. (2018). 2018 Edelman TRUST BAROMETER - edelman.com. [online] Available at: https://www.edelman.com/trust-barometer [Accessed 6 Oct. 2018]. BBC News. (2018). I 'regret' my Grenfell reaction - May. [online] Available at: https://www.bbc.co.uk/news/uk-44440479 [Accessed 6 Oct. 2018]. Paton, G. (2018). You have failed Grenfell victims, mayor tells Theresa May. [online] Thetimes.co.uk. Available at: https://www.thetimes.co.uk/article/you-have-failed-grenfell-victims-mayor-tells-may-b2b7cmqf0 [Accessed 6 Oct. 2018]. Blakely, R. (2018). Kremlin bots sow fear in West about GM crops and vaccines. [online] Thetimes.co.uk. Available at: https://www.thetimes.co.uk/article/kremlin-bots-sow-fear-in-west-about-gm-crops-and-vaccines-f7h6w0qq7 [Accessed 6 Oct. 2018]. Ridley, M. (2018). My cure for Disease X? A bit of positivity. [online] Thetimes.co.uk. Available at: https://www.thetimes.co.uk/article/my-cure-for-disease-x-abitofpositivity-ltlsdhzj7 [Accessed 6 Oct. 2018]. BBC News. (2018). UK life expectancy progress 'has stopped'. [online] Available at: https://www.bbc.co.uk/news/health-45638646 [Accessed 6 Oct. 2018]. Poldrack, R. (2018). What is loss aversion?. [online] Scientific American. Available at: https://www.scientificamerican.com/article/what-is-loss-aversion/ [Accessed 6 Oct. 2018]. Maslow, A. (1943). A theory of human motivation. Psychological Review, 50(4), pp.370-396. Levitin, D. (2014). The Organised Mind: Thinking Straight in the Age of Information Overload. Penguin Books. Positive News. (2018). Progress: the great untold story of our time - Positive News. [online] Available at: https://www.positive.news/opinion/progress-the-great-untold-story-of-our-time/ [Accessed 6 Oct. 2018]. Our World in Data. (2018). Our World in Data. [online] Available at: https://ourworldindata.org/ [Accessed 9 Oct. 2018]. Our World in Data. (2018). Most of us are wrong about how the world has changed (especially those who are pessimistic about the future). [online] Available at: https://ourworldindata.org/wrong-about-the-world [Accessed 9 Oct. 2018]. Ourworldindata.org. (2018). 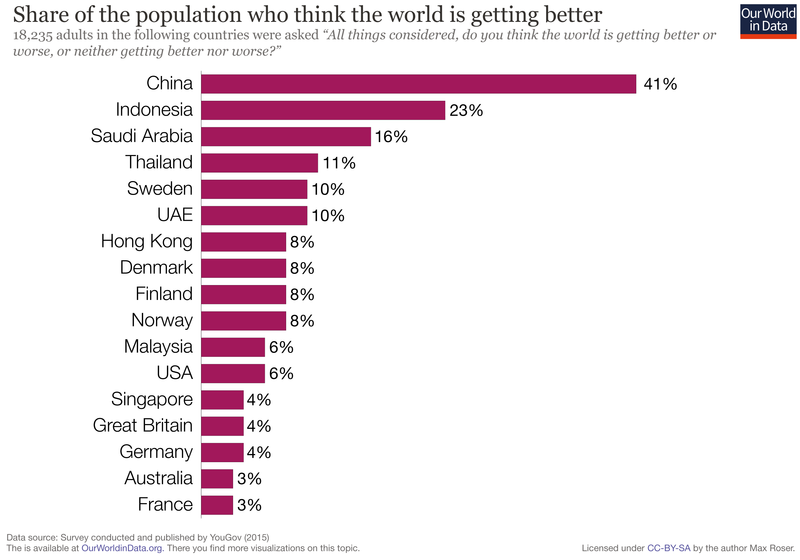 Optimistic about the world chart.. [online] Available at: https://ourworldindata.org/wp-content/uploads/2018/07/Optimistic-about-the-future.png [Accessed 9 Oct. 2018]. BBC.co.uk. (2018). BBC World Service - Compassion Fatigue. [online] Available at: https://www.bbc.co.uk/radio/play/w3cswrkk [Accessed 6 Oct. 2018]. Ellis Jones. (2018). 3 principles for positive public relations. [online] Available at: https://ellisjones.com.au/disciplines/marketing-pr/3-principles-of-positive-public-relations/ [Accessed 6 Oct. 2018]. CSR Pulse. (2018). Communicating CSR: The Role of Public Relations - CSR Pulse. [online] Available at: http://csrpulse.com/communicating-csr-the-role-of-public-relations/ [Accessed 6 Oct. 2018]. Housel, M. (2018). Why Does Pessimism Sound So Smart? -- The Motley Fool. [online] The Motley Fool. Available at: https://www.fool.com/investing/general/2016/01/21/why-does-pessimism-sound-so-smart.aspx [Accessed 6 Oct. 2018].